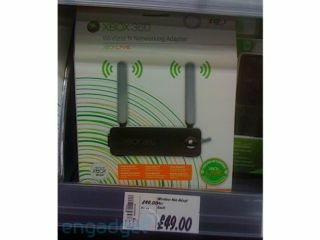 Microsoft's eagerly-awaited wireless adaptor for the 802.11n standard has been photographed on sale in the UK. The next generation of the Xbox wireless adaptor has been popping up and then disappearing for several weeks, but appears to have finally broken cover with little fanfare. Engadget managed to get hold of a photograph of the adaptor on sale in Asda – with a retail price of £49.99. With much of Xbox's big message to the public now about its community and the multiplayer games that have proven to be a hit on the platform, the need for a top quality wireless adaptor is paramount. The 802.11n standard was finally brought out of draft recently, and, if you can bring yourself to part with £50 for the adaptor, then you can now have an official add-on for the Xbox.